I was watching some videos and came across this one. It starts out with a car running off the track. For the car with the camera, it looks like a tough situation. No room to move laterally. Decel and yield? or let 11 run off like he did? ...he was practically in the grass when he initiated the pass. Meanwhile, does it look like #061 (green) is being a little pushy? Jumping ahead to about the 2 minute mark it looks like he is focused on passing with no care for the corner ahead. Is this pretty much a classic "dive bomb"? If it were me, I'd let car 11 run off the track, as he was the one that tried initiating the pass while on the grass. The 11 put himself in the position of probable failure. But I don't know what the situation was; is there a history with those two drivers? Is the 11 car the camera car driver's brother in law? Did the 11 car hit the camera car during the last race? Maybe there was a car pushing the camera car from behind and he couldn't really back out of it. That is the problem with watching these videos, you only get a small slice of what was going on. There is a lot of give-and-take during a race, especially if it is against guys you race with all the time. Being aggressive is okay, but you don't want to take out someone else. It is amateur racing, after all - you have to keep in mind that it is just a sport that is supposed to be fun, there aren't world championships or millions of dollars at stake. As far as the green car being pushy, he was just being aggressive at the start, which is normal. It was hard to see exactly what happened when he crashed into the other car, but it didn't look like a "dive bomb" pass to me. A dive bomb is when you come from way back in a desperate move that forces the other driver to either give room or get smashed. It's not something that you want to try often, refer to my comments above. 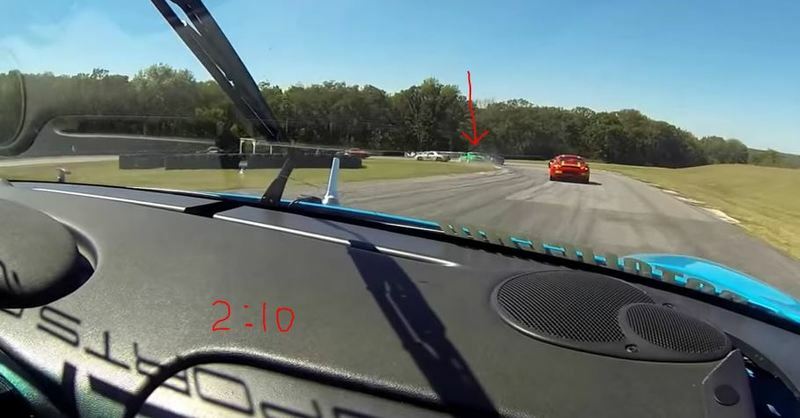 Regarding the crash, it looks like the green car set up to the inside to make the pass, then ended up getting on the grass on the inside of the corner, which led to not enough traction to make the turn, which then led to hitting the car he was trying to pass. 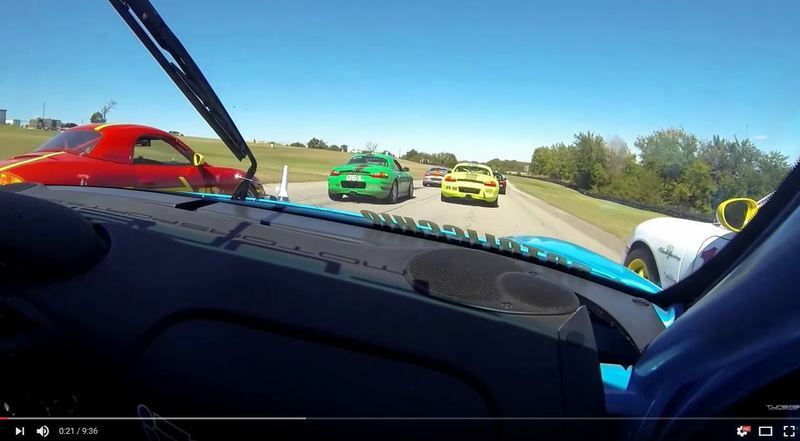 It could have been that the green car just made a dumb mistake, or the car on the outside left the green car zero room, and the green car was committed to the pass and you can see the results in the video. Again, please refer to my comments above about give-and-take. No one wants to get passed, but if the other driver has committed to the pass and can't avoid you if you block him, then you have to give the passing car some room, especially at the beginning of the race. If it is the last lap, then that is different. 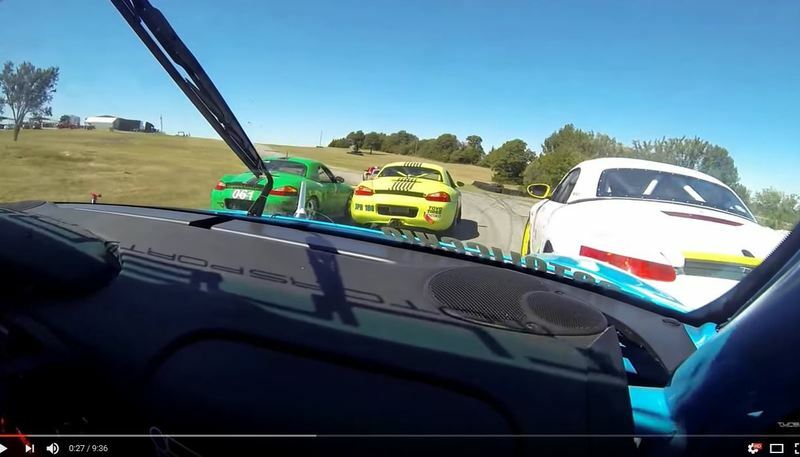 Situational awareness is a very valuable talent to develop for racing. Last edited by Racer Boy; 12-22-2016 at 06:59 AM. The first half is the driving line, but the second half discusses racecraft, passing, etc as voiceover narration to the race. Pretty interesting. Thanks for the comments. Personally, I'm usually very calm and easy going, but in competition, things change. The better I know the rules - written and unwritten - the less chance of anyone getting hurt. Steve, I appreciate that video. The pass in the last minute is a great example of patiently waiting for an opportunity and using it. 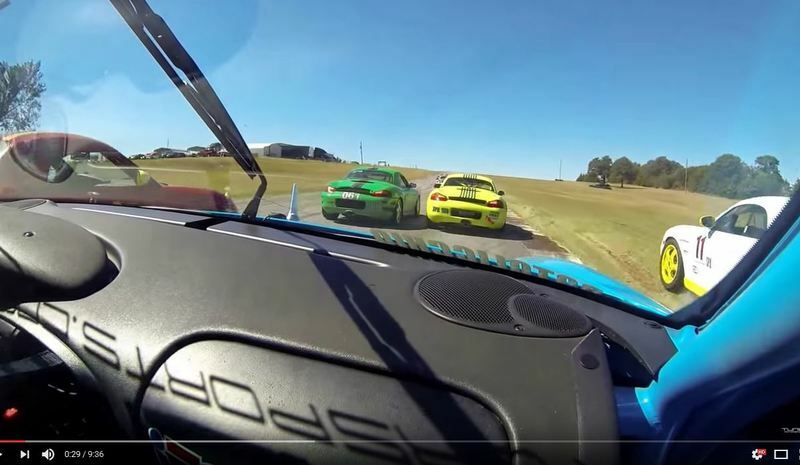 That RX-7 was not going to let him by voluntarily ...and using the other Miata to block in the straight was great. Last edited by 78F350; 12-22-2016 at 09:58 AM. Jon - probably the biggest cause of the two incidents is what is happening within the dynamics of the race itself. In the first incident at turn 1, there are approximately 30 Boxsters all working their way through that turn in about a 3 second span. That's the first turn off the straight as the cars were released for the start of the race and they are all jockeying for position. You know from driving that turn that the correct place to exit the turn is right where the video car is at the 0:29 point. The #11 car is positioned correctly at the 0:21 point coming down the front straight, but is forced to stay too far right going into the turn. It looks like he's just trying to make the best out of being forced wide and still maintain some position. It looks lie a similar thing at the 2:10 point at turn 2. Those guys are still bunched pretty tight at the start of the second lap. Coming downhill off the straight and braking and then going into that hairpin turn and positioning yourself to come out of it correctly is a challenge to me on a good day. With 4 or 5 guys all trying to be in the same place at the same time, it gets pretty crowded. I'm all for playing a good bluff to maintain (or gain) position. It's just that sometimes your bluff gets called. Tom and some of the experienced SPB racers may have more to add to this, but in "bench racing" with some of the SPB guys, it sounds like the SPB class is a little more rough and tumble than some of the other classes. I'm slowly learning/understanding that driving a Boxster correctly is all about maintain energy, and once you give up even the slightest bit, you play hell trying to get it back.